Emerging markets attracted more clean energy investment than wealthy countries for the first time ever in 2014, according to a new report. Climatescope, the national clean energy competitiveness index from Bloomberg New Energy Finance found that 55 countries considered to be ‘emerging markets’ were accountable for a record annual high of $126bn of renewable investment for 2014 – up 39% from 2013 levels. The 55 Climatescope countries cover Africa, Asia and Latin America and the Caribbean. The group includes major developing nations China, India, Pakistan, Brazil, Chile, Mexico, Kenya, Tanzania and South Africa. The report noted the ‘remarkable growth’ in China, where 35GW of renewable power generators was added – more than the 2014 clean energy projects in the US, UK and France combined. 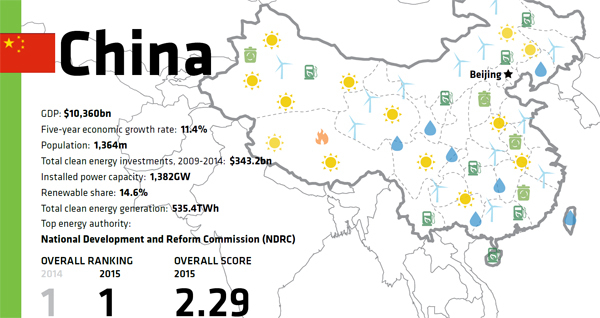 The report highlights that China has played a major role in the current trend that clean energy capacity is growing twice as quickly in Climatescope nations compared to Organisation for Economic Co-operation and Development (OECD) countries. The uptake in growth has occurred despite the economic rates of the 55 countries slowing. Average GDP growth across the nations fell by around 0.5% to 5.7%. However Brazil, South Africa and China still attracted a total of $103bn in clean energy investment. This was aided in part by the continued decline in clean energy costs. The cost of solar PV has fallen 15% year-on-year globally. Solar in particular is competitive in the 55 nations due to high fossil fuel prices and sunny conditions. Wind, small hydro, geothermal and biomass are also increasingly competitive. Despite the continuous growth an estimated 1.3bn people continue to lack access to energy. Tanzania is leading the charge in making clean energy available to the masses through small-scale renewable mini-grids with Bangladesh, Kenya, Nepal and Uganda also performing well. It has already been suggested that Africa could generate 50% of its energy from renewable sources by 2030 if they were to follow guidelines laid out in a report from the International Renewable Energy Association. News of the rising prominence of lesser developed countries comes on the eve of an important round of UN-organized climate negotiations kicking off in Paris at the end of November. Countries have spent the last few months working to publish national climate action plans ahead of COP21.